Home / Worth writing about… / Event / What did we achieve at the Marks and Spencer AGM for shareholders? What did we achieve at the Marks and Spencer AGM for shareholders? Thanks for all of your support and sharing of our live updates from the Marks and Spencer AGM (annual general meeting) on Tuesday 7th July on Twitter, Instagram or Facebook – take a look back over our activities and responses. Before the AGM started we handed out 250 special handkerchief craft kits with a Living Wage message printed on them to shareholders, so that they can stitch too, to support the Living Wage. These kits included an ethical hanky, needle and thread, instructions, and a briefing note on investment risk. The gifts were well received, as were our smiles and welcoming words. All kits went quickly and lots of people encouraged us in our work and agreed M&S should be a Living Wage employee (some people where shocked to know that they aren’t a Living Wage employee already). 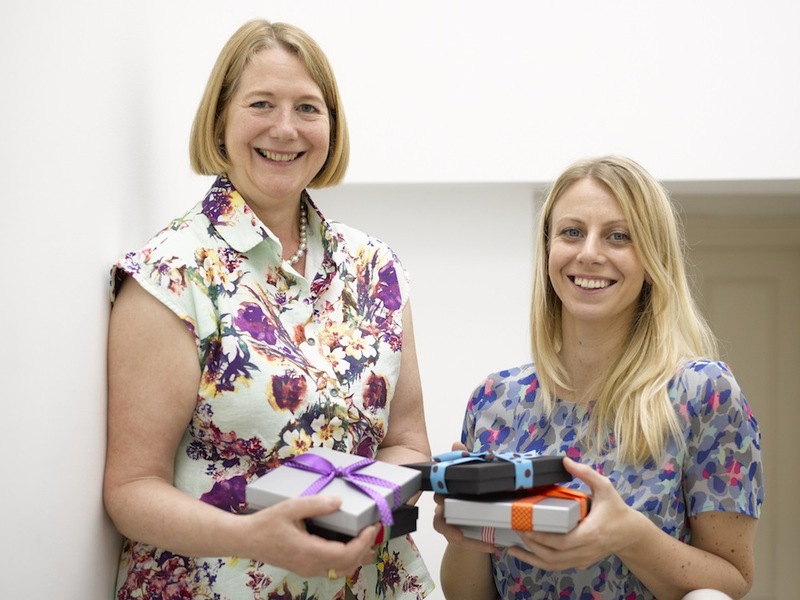 We hope people treasure their gifts, use their hankies as a catalyst for conversations and campaigning on this issue and for it to stay in their minds. When registering our questions before the AGM starts, many of the Marks and Spencers staff we spoke to repeatedly told us that they had been following our campaign and were very much aware of our activities and media coverage (including Guardian online, Observer magazine, Time Out amongst others as well as tweets from influential people such as Womens Institute groups, Owen Jones, Lucy Seigle etc). Some staff where very friendly, some where more defensive or wary of us. Thoughout the AGM we had lots of people on Twitter sharing our activities which only helps the cause. One of our tweets had 70 retweets and 54 favourites on the day. 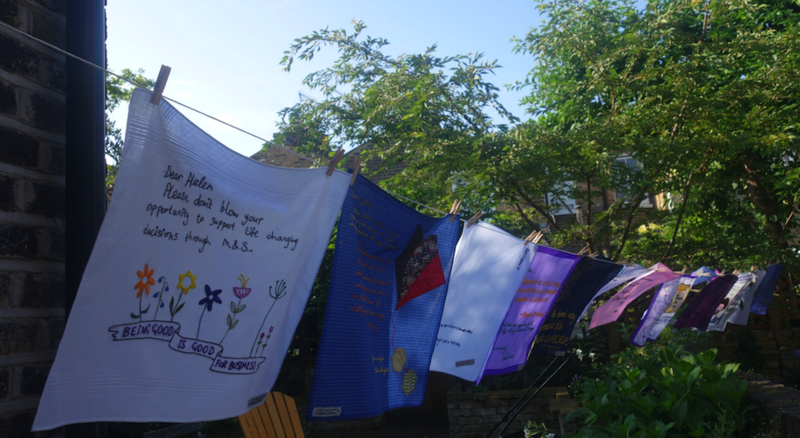 Half of the 14 handkerchief gifts where given to Board Members before the AGM started & half shown during our question I (Sarah C) asked – we all stood up smiling & holding up the remaining the gift boxes for all to see & then handed them over after the AGM for a respectful chat. We got lots of claps from the audience. The Chairman of Marks & Spencer, Robert Swannell, and the company’s board, praised our creative campaign numerous times throughout the AGM including the introduction which is pretty unheard of for any campaign. Robert thanked us for his beautiful hanky made by craftivist Fran Reynolds and said on the microphone that she had clearly researched his work, passions and values and wrote him a thoughtful letter which moved him. Four questions in total were accepted and asked by Shareholders at the AGM Q&A including from me, hanky maker & trustee of ShareAction Caroline Instance, ShareAction staff member Lisa Nathan, Labour Behind the Label campaigner Anna McMullen on the Living Wage given to all of M&S employees overseas and a retired economist shareholder man who asked what percentage of staff are on minimum wage (the question was not answered) and said being a Living Wage employer makes business sense. Robert could have taken our questions off his list by saying they are all too similar because they are on the one them. But the fact that he didn’t censor us gives us an indicator that he is warm towards the Living Wage. “This campaign was a test case for how these campaigns should be run”. Robert later spoke to me afterwards and described our work as “an approach that appeals to us all.” “The way you’ve done this is remarkable”, he said. “It’s a campaign that is thoughtfully done and heartfelt. We feel every bit as heartfelt about our employees. It got more conversation than any campaign outside.” We was genuinely moved by his hanky & told me “Send Fran my love, I mean regards” after I told him she couldn’t attend due to illness. Marks and Spencer have also agreed to meet with ShareAction over the next coming months to discuss paying the Living Wage. The still kept saying that their bonuses and discount help their employees but we have to keep pushing them on how that doesn’t pay for people’s rent and necessities. Many of the Board Members met with us individually after the AGM to thank us for the campaign, gifts and tell us their views on Living Wage. We made a notes on their comments which will be super useful to help us with future campaigning to see the best way to approach the subject with each individual board member, who are potential allies, blockers etc. For example, I had a private chat with my hanky-reciever who was very honest about her views on the Living Wage and what barriers are stopping M&S from implementing it. She was very warm, open and honest & gave me her email address to follow up with her after I said that our hankies are only the start. We reminded them all that their hanky-maker will be in touch next week & throughout the next year to hear their progress on Living Wage. All of our future insight will build on the work we’ve already done. We won’t give up! 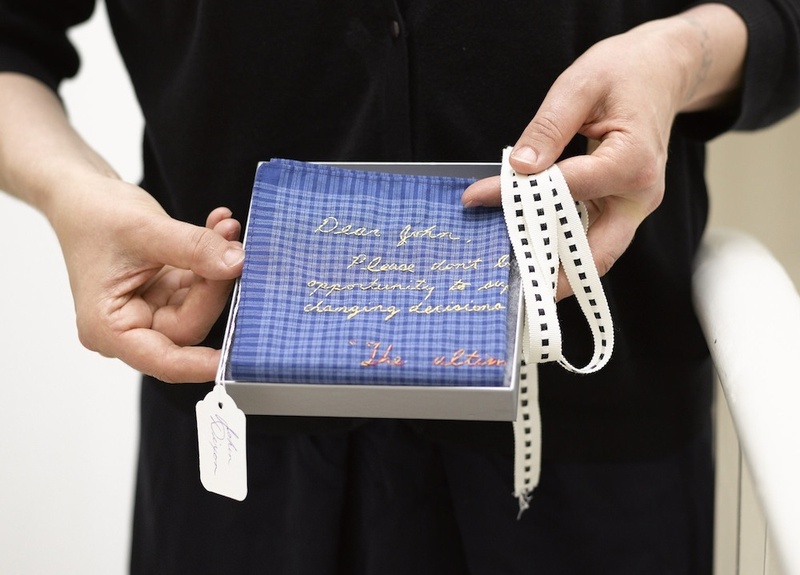 All hanky-making craftivists for this project have spend over 6 hours each hand embroidering their gift for their allocated person (board member, celebrity model or one of the Chief Investment Officers of the 5 biggest shareholding companies in M&S). Whilst stitching we all made time for our ‘crafter thought’ about Living Wage, M&S work, their individual VIPs strengths, challenges, passions, hobbies. We’ve all learnt a lot more about the Living Wage, M&S and how we can be effective and strategic craftivists. 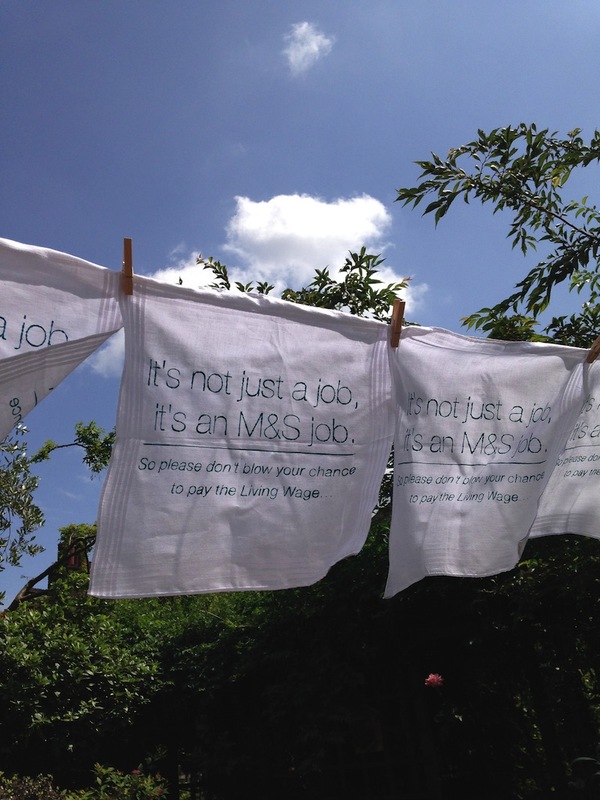 We are passionate and determined to keep conversation and relationship going with our individual hanky-recievers to help encourage M&S to lead the way for retailers and implement living wage. We will all keep campaigning with the help and advice of ShareAction using our hankies as a catalyst. This is only the start. 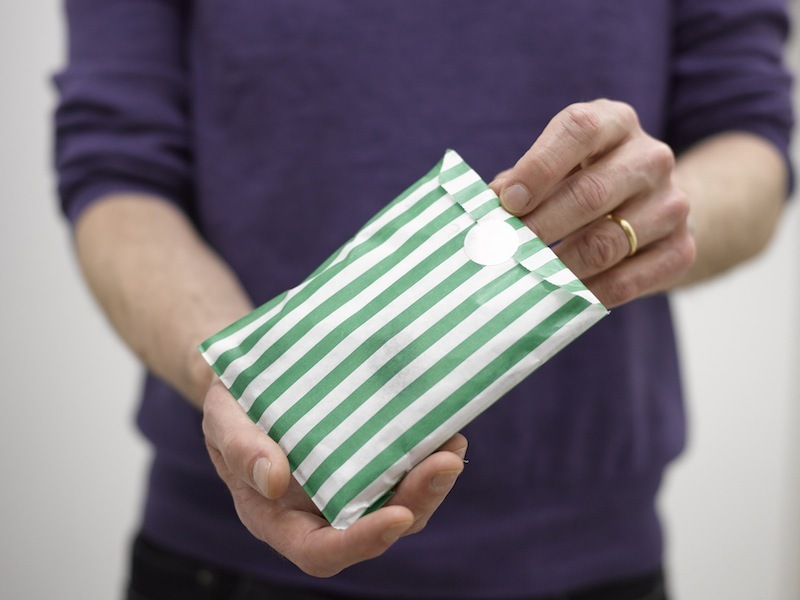 We’ve inspired people to have a go themselves using our Don’t Blow It handkerchief kits to engage someone influential they want to collaborate with e.g. local politician, journalist, teacher, police etc. We’ve shown campaigning organisations and individuals new ways to do activism that they might not have thought of before that they can also implement. M&S has an opportunity to show leadership by becoming the first major high street retailer to pay its staff wages they can live on. But it’s crucial we keep up the pressure in the months to come to make sure the campaign is a success. Will you donate to support our Living Wage campaign? 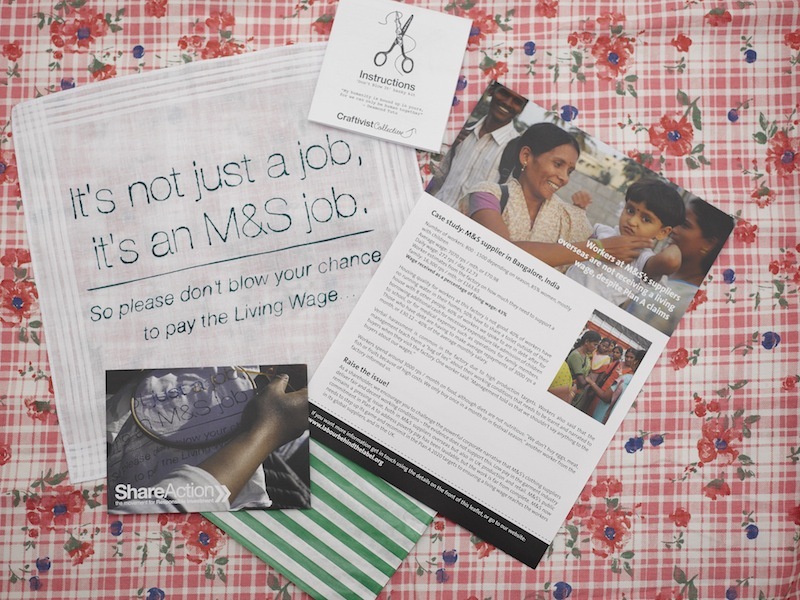 Stay up to date with this campaign here Continue to keep the conversation going around M&S not paying a Living Wage & how they could lead the way for the retail sector. “Being good is good for business” as the founder of the Body Shop Anita Roddick said. Proud to be associated with the craftivist way of making change. Congratulations to everyone who planned, prepared and delivered the M&S ‘protest’. I’m delighted that this isn’t a flash in the pan and that it has had such a positive beginning. Hope to be a more active craftivist in the near future! Brilliant campaign very well executed. To get this level of engagement with the influencers is really impressive.Only hope I can help in this and other campaigns.